Lagos — A few weeks after Muhammadu Buhari's stunning electoral victory in 2015, he declared: "From the first day of my administration, Boko Haram will know the strength of our collective will and commitment to rid this nation of terror, and bring back peace and normalcy to all the affected areas." Since he penned that promise in The New York Times, Nigeria has suffered at least 5,757 deaths attributable to Boko Haram, 2,984 blamed on state actors, and another 4,013 that point to some combination of the two, according to Council on Foreign Relations data. In addition, hundreds of Shiite religious minorities died at the hands of the military, violence between farmers and pastoralists has exploded, and a secessionist movement in the southeast is simmering. At the moment, the February 2019 presidential election in Nigeria appears to be a dead heat. A September poll by National NOI reported that 43% of Nigerians approved of Buhari's performance, 42% disapproved, and a rather sizeable 15% of the population was up for grabs. 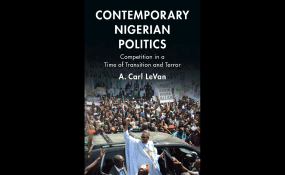 Research for my new book, and some survey data, suggest that Buhari's record on insecurity is not necessarily critical to winning the 2019 election. In response to an open-ended survey question in 2017, Afrobarometer found unemployment and "management of the economy," ranked first and second (53 percent and 35 percent, respectively) among citizens' priorities. Insecurity was not mentioned. I found that insecurity, and specifically concern about Boko Haram-related violence, ranked high among citizens' minds in the two years or so before the 2015 election. But Buhari's All Progressive Congress (APC) won on a platform that emphasized economic growth, anti-corruption, and electoral integrity. Through a content analysis of 929 coded references, I found that the APC and the then-incumbent People's Democratic Party (PDP) systematically emphasized different issues. One unexpected finding concerned the "non-issues" that the PDP talked about: the party barons were more likely to campaign by attending funerals, weddings, and parties. The PDP also failed to capitalize on some of its strengths, including gender and some modest improvements for women during President Goodluck Jonathan's tenure. The APC mentioned such "social issues" twice as much, despite Buhari's outdated views on women. These findings are important because they demonstrate that there were substantive differences between what Nigeria's parties talked about in 2015. While these differences might not amount to the ideological contrasts nostalgically recalled from post-independence era, it does suggest that issues and party platforms are starting to matter. My statistical analysis of survey data shows that President Jonathan's team sought to mobilize the party's base by cultivating political polarization on the issue of insecurity. In the end, poorer, more economically pessimistic voters rallied to Buhari. I found that citizens' evaluation of past economic performance, self-reported level of wealth, and expectations for which party would improve the economy, all strongly correlated with voting intentions in 2015. Once again, the ruling party is vulnerable on the economic issues. Nigeria's economy contracted by 1.6 percent in 2016. Inflation remains high – around 11 percent. Though oil prices have recovered, and the World Bank's forecast for 2018 is about 2.1 percent GDP growth, this does not appear to give Buhari a strong issue to run on. In such situations, the classic African story is for politicians to turn to social cleavages to mobilize voters. In 2015, I found that religion predicted Nigerians' voting preferences even more reliably than ethnicity. Specifically, an individual's self-identification as a Muslim corresponded with a nearly 56 percent decline in support for Goodluck Jonathan, the incumbent, Christian president from the south. These results hold up even after controlling for factors that could interfere with the predicted relationship, such as income, education, gender, age, and the popularity of a state's governor. This mitigates some of the "good" news from my findings about the PDP and the APC campaigning on different issues, and the politicization of religion is a warning for future electoral contests. However, for 2019, both candidates are northern Muslims. Buhari is squaring off against former Vice President Atiku Abubakar, from Adamawa (one of the northeastern states heavily impacted by Boko Haram). The two candidates will therefore need to distinguish themselves on the issues in order to win. Anti-corruption remains Buhari's strongest card to play. Two former governors, Joshua Dariye and Jolly Nyame have both been sentenced. While corruption investigations are common and allegations are an impulsive political habit, convictions of high-level officials are very rare. Despite the lagging economy, Buhari might construct an effective message there. As I show in my book, voting on the economy is not simply about evaluations about past performance or a voters' subjective condition. It is also about whether voters believe the candidate offers a convincing message of hope. However, such a message has been contaminated by Buhari's credibility gap in other areas. As President Jonathan learned with the #BringBackOurGirls movement, mishandling one policy area results in reputational spillover to other areas. President Buhari recently had to offer a "proof of life" in response to bizarre allegations flooding social media that he was no longer alive and the government was using a body double. This appears intended to cynically evoke memories of President Umaru Musa Yar'Adua's long absence from public view due to poor health in 2010. Buhari also left the country for seven weeks to receive medical treatment. More importantly, Buhari's administration has often misled the public about progress against Boko Haram. Most recently, the military very publicly disputed casualty figures in recent battles, since larger losses by the Army would imply that the insurgency remains deadly – and Buhari has not lived up to his 2015 campaign promises. The Islamic State West Africa's Province (ISWAP) currently claims to control areas such as Buni Gari, and apparently the military did not successfully re-take the towns of Arge and Kangarwa. At its worst, the administration has put civilians at the center of this propaganda war. Refugees International earlier this year noted that humanitarian agencies could not reach 930,000 people in need of assistance due to military restrictions on movement, and many Internally Displaced Persons (IDPs) were being pressured to return. A veneer of normalcy, with former victims returning home, would create compelling optimistic optics. However, the northeast remains anything but normal. The United Nations estimated in September that 7.7 million people require humanitarian assistance in Borno, Yobe and Adamawa states. Thus, even if insecurity and the humanitarian crisis are not the priority they were for voters in 2015, they could hurt his chances by influencing the public's assessment of his promises. My analysis of the last election also offers an important finding that should inform both the conduct and the content of the current presidential campaigns: in 2015 voters demanded electoral integrity and rewarded the party that offered it. Voters need to believe the probity of the democratic process itself, and in the long run, all Nigerians win with free and fair elections.